Recombinant fragment corresponding to Human ATF3. ab58668 was purified using protein G column chromatography from culture supernatant of hybridoma cultured in a medium containing bovine IgG-depleted (approximately 95%) fetal bovine serum and filtered through a 0.22µm membrane. Our Abpromise guarantee covers the use of ab58668 in the following tested applications. WB Use at an assay dependent concentration. Detects a band of approximately 35 kDa (predicted molecular weight: 21 kDa). ab58668 staining ATF3 in A549 cells treated with ionomycin Ca2+ salt (ab120116), by ICC/IF. Increase in ATF3 expression correlates with increased concentration of ionomycin Ca2+ salt, as described in literature. The cells were incubated at 37°C for 2h in media containing different concentrations of ab120116 (ionomycin Ca2+ salt) in DMSO, fixed with 4% formaldehyde for 10 minutes at room temperature and blocked with PBS containing 10% goat serum, 0.3 M glycine, 1% BSA and 0.1% tween for 2h at room temperature. Staining of the treated cells with ab58668 (10 µg/ml) was performed overnight at 4°C in PBS containing 1% BSA and 0.1% tween. 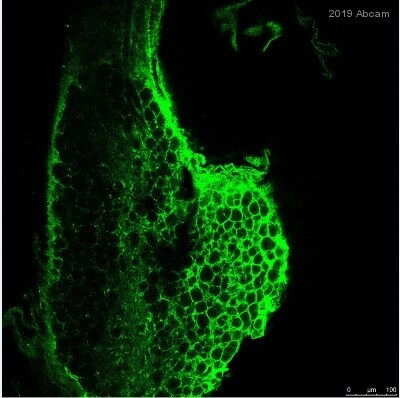 A DyLight 488 goat anti-mouse polyclonal antibody (ab96879) at 1/250 dilution was used as the secondary antibody. Nuclei were counterstained with DAPI and are shown in blue. 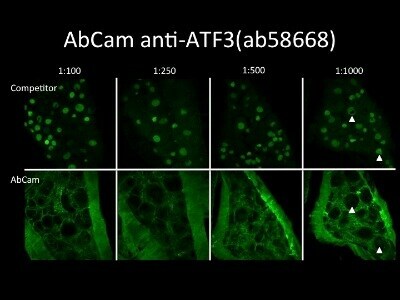 ab58668 staining ATF3 in A549 cells treated with ionomycin (free acid) (ab120370), by ICC/IF. Increase in ATF3 expression correlates with increased concentration of ionomycin (free acid), as described in literature. The cells were incubated at 37°C for 2h in media containing different concentrations of ab120370 (Ionomycin (free acid)) in DMSO, fixed with 4% formaldehyde for 10 minutes at room temperature and blocked with PBS containing 10% goat serum, 0.3 M glycine, 1% BSA and 0.1% tween for 2h at room temperature. Staining of the treated cells with ab58668 (10 µg/ml) was performed overnight at 4°C in PBS containing 1% BSA and 0.1% tween. 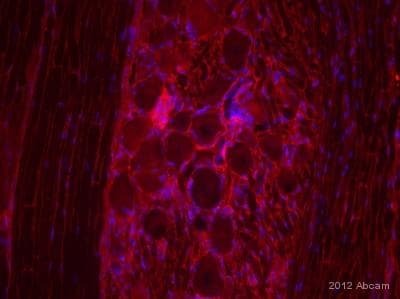 A DyLight 488 goat anti-mouse polyclonal antibody (ab96879) at 1/250 dilution was used as the secondary antibody. Nuclei were counterstained with DAPI and are shown in blue. Publishing research using ab58668? Please let us know so that we can cite the reference in this datasheet.